The current town of Victoria was originally established as two distinct communities. The first was Victoria, named after Queen Victoria, founded by 38 Scottish immigrants under the leadership of George Grant. The area was surveyed and platted in 1873. It was the hope of the immigrants to bring British agricultuaral methods and a genteel way of life to America. They failed in both respects. They did however bring the Aberdeen Angus cattle to the area. Most of the immigrants returned to Scotland within a few years. George Grant remained in the Victoria area and was buried in front of the St. George Episcopal Chapel. His grave can still be viewed on the northeast corner of 1st Street and Angus Drive. Click the picture to the right for more information. The original town site of Victoria was an area generally south of today's railroad tracks and east of Main Street. 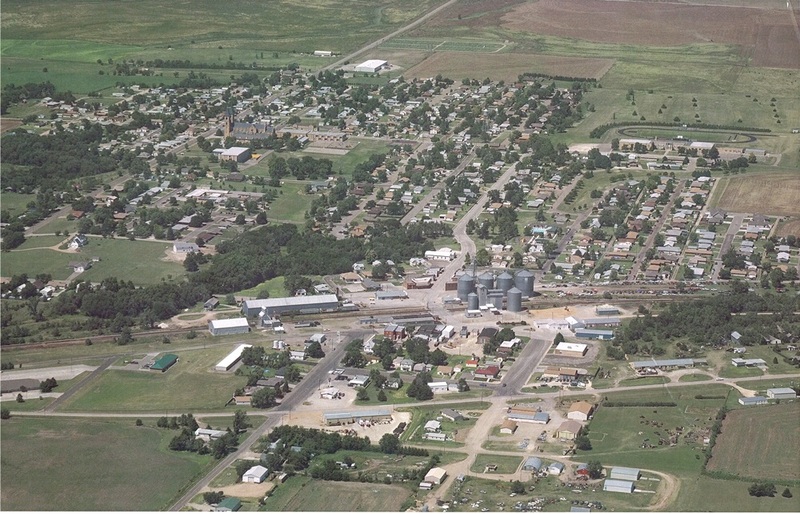 Victoria's birth as a town site is closely tied to the construction of the Kansas Pacific Railroad through the area. 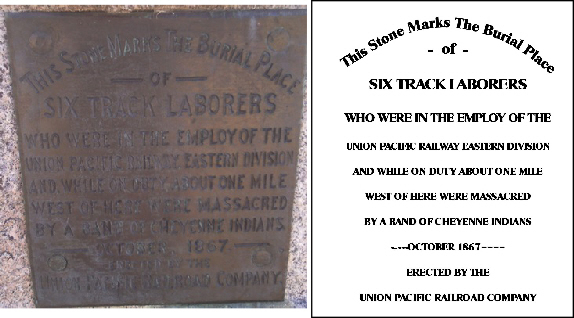 A memorial on the south side of town marks the graves of six track workers killed near here by Cheyenne Indians in 1867 while working on the new rail line. Click the picture to the right for a clearer picture. Herzog was founded April 8, 1876 by twenty-three families of German immigrants from the steppes of Southern Russia around the Volga River where their ancestors had migrated a century before at the invitation of Empress Catherine the Great. Unhappy with the Czar's military prescription and fearful of the Russian attitude toward their Catholic and Lurthern faith, the left Russia in search of farmlnad in the United States. Within weeks of their arrival, Fr. Adolph Wibbert celebrated Mass in the home in Alois Dreiling. By 1877 plans were made and work was begun on a permanent church measuring 60 by 30 feet dedicated to the Sorrowful Morther. Herzog was generally located west of present day Cathedral Street and north of 12th Street. 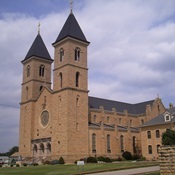 The magnificent limestone St. Fidelis Church, the Cathedral of the Plains, is the most recent church built by the German settlers of Herzog. It was dedicated August 27, 1911. A historical marker on the south side of town describes the settlement of both Victoria and Herzog. Click the picture to the right for a bigger picture. Just as the Kansas Pacific Railroad (present day Union Pacific) had a major impact on the City's physical, social, and economic development in the 1800s, the construction of Interstate 70 has had a profound effect on the City's more recent development. With the link between Russell to the east and Hays to the west complete in 1966, the City of Victoria was connected to the growing national network of interstate highways. In addition to connecting Victoria with the interstate system, the completion of I-70 also transformed the physical development of the City. Prior to the completion of I-70, east-west vehicular traffice used US Highway 40, which ran along the southern boundary of Victoria. After completion of I-70 to the north, urban development began moving in that direction. 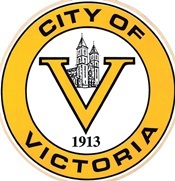 Since 1900, the City of Victoria had grown from a population of 507 to a 2010 population of 1214. The town is continuing to expand, with a new subdivision being developed on ground that used to be the town's golf course. Click the picture on the right for a bigger picture. The lots in yellow are the first phase of the developement, with the blue and green lots to be developed later.